I begin this article somewhat differently than others, in a feeling of defeat in my battles. This feeling comes from the realization of our futility in a spiritual fight against a growing, dark cloud of impending doom- the coming Apocalypse. During this time, I am reminded of the words of my Lord, saying, “Not by might, nor by power, but by My Spirit, says the LORD of hosts” (Zech. 4:6). I consider that our God is not contained in the physical powers of His natural laws, but He is still found in the “small, still voice” that comforts and corrects and changes the hearts of straying mankind. As for my feelings of futility and bleakness, it comes with a another day in a world that increasingly darkens in crimes and injustices, with unaccountable political elites, and by acknowledgment of the dwindling voices of my everyday countrymen. Too few are concerned about the relentless social engineering agenda of the U.N., corporatist elites accumulating the world’s wealth, and progressive globalists. Too few Christians know the prophecies concerning our time, specifically the ones found in Revelation- sacred passages that warn of a global system of Satanic influence/control by an entity commonly called by the scriptural epithet, “the Beast.” The war carnage of his coming tyranny will entail the loss of over 1/3 of the world’s population. According to Scripture, this monetary system will eventually be enforced in barbaric and torturous ways, especially within the nations that rest under a collective entity known as the “False Prophet,” wherein dissidents, Christians, and Jews will be “beheaded” for not submitting and bowing to its coming political-religious leader. But it is not that this day of doom (and refinement of the elect via persecution) is coming, that it should weigh my soul down in a sleepless night; the greater burden comes with discerning our futility and helplessness, of watching it unfold in an indifferent and mostly complacent world. Nations of the West have become morally bankrupt, and lawlessness increases even as governments grow more fascist and intolerant of their law-abiding citizens. While Muslims flow in and a new religion of progressive political correctness demands absolute compliance, citizens are attacked and denied a voice and rights. Sadly, many of us must reminisce about more innocent days in the sun, before we awoke to what the future inevitably holds, just to keep a sense of sanity and light in an otherwise insane world. Ignorance was bliss, as often said, and for this reason it is almost enviable, especially as we watch all of the happy and laughing faces on morning news programming and cheering fans at ball games- those who are living life for the moment, generally unaware and unconcerned about their constitutional rights being legislated out of existence by bureaucrats; their private conversations being stored and categorized by the federal government- analyzed and even commercialized for information purchasers. Rather than dwelling on our biblical beliefs and virtues being demonized as evils are embraced, and the numerous progressive organizations that daily pursue the downfall of what’s left of our Judeo-Christian culture, it’s much easier to find a classic movie or television series of more innocent times (two favorites of mine being Gilligan’s Island and Little House on the Prairie). It helps the soul a bit to look back on the sweetness and sense of innocence that once existed in our national conscience, before political correctness made good evil and evil good. Yet, even in doing so, we cannot truly escape the reality of over a century of leftist indoctrination in our secular humanist universities, and its horrid effects on families and communities- the moral relativism nation which we now must begrudgingly endure. We cannot ignore that Judeo-Christianity has long been considered the greatest enemy of our progressive foes- not sharing in their humanist enlightenment of abject materialism and their dream of a multicultural utopia in a borderless world. We cannot convincingly ignore that the global Left has recruited Islam into their generational agenda to finish the job that they began of silencing/destroying the Judeo-Christian worldview. Indeed, they maliciously seek to break even what little is left of our collective power and social influence. We cannot ignore that our media is owned by a handful of elitist, globalist families, progressively shaping news with their self-parroting organizations rather than properly reporting it, or that capitalism has been perverted by the greed of politics, with back-scratching favors for campaign funds, with economic schemes that ravish the Working-and Middle Class citizens who have no idea that the nation is being sold from under us to foreign powers, or that corporations must now pay homage and publically promote politically correct progressive agendas (e.g., homosexual normalcy and demonic themes in everyday household products). What we can do, and often do, is find an escape to stick our proverbial heads in the sand, although it becomes increasingly challenging to do so with the future we now face. Indeed, it becomes evermore difficult for Bible-believing people to find something in this world that can encourage us as we consistently lose on every spiritual front (e.g., in public education, with biased media, on abortion, on homosexual marriage, on racial harmony rather than leftist forced favoritism, and on ending he influx of Islam and terrorism (and the political posturing it inevitably brings to inviting host nations). And even within our own ranks, much of Christianity has become commercialized and liberalized by glamorous gurus who push a product of motivational encouragement, making those who naively feed their insatiable coffers feel just good and holy enough to continue buying their endless stream of sensational products. The real spiritual battles are not being fought by mainstream Christianity, and sound biblical doctrine is no longer endured- only personalized spiritualism that has no historical roots and flees shamefully from the fight at first sign of encroaching challenge and/or persecution. Everyone wants to feel positive and above the cultural fray (millions looking for a rapture escape before Hell erupts on Earth), and who can blame believers for getting it wherever they can? 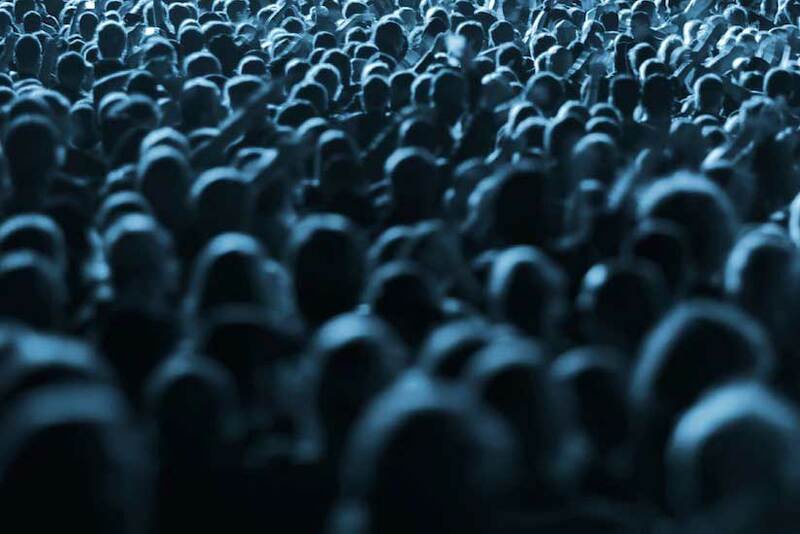 But the reality of the situation- the harsh truth on the ground- is that the night grows darker on biblical faith, at least here in the West, and too few teachers and preachers are prepared to share the whole Word of God at all costs. And when we compromise with the world, we always lose, taking step by step backward into a new form of Western feudalism and finally the abject paganism and persecution of our of Greco-Roman beginning, pushed over the edge (or falling away) in a world that more and more rejects us for the new religion of progressive fascism. Nevertheless, all the battles that we have lost have not determined the outcome of this culture war. In the end we will prevail with Christ. How can we begin to win before He comes and saves us and Israel? We can have partial victory and unity by learning the Bible and teaching the Book of Revelation for this dark time. Indeed, Revelation was primarily given for us at the end of this age, for this very time, to strengthen the weak during increasing persecution. Revelation is a book of victory for the chosen and faithful who will not sacrifice truth on the world altar, even when we find ourselves against the entire progressive humanist construct and their Islamic tokens, whom they increasingly justify despite Judeo-Christian persecution and barbaric acts of terrorism. 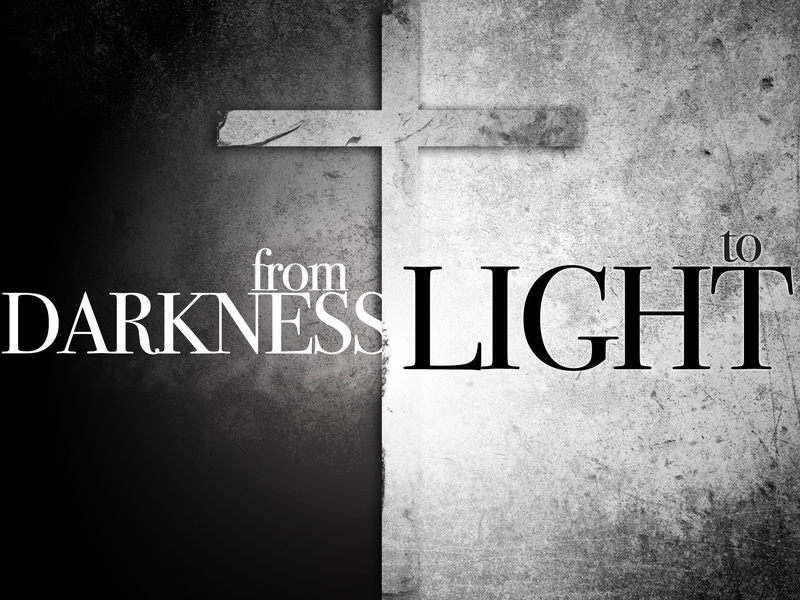 The truth of our fight is bitter to digest, for it requires a profound awakening to what is coming upon us, but we can gain some sense of confidence when we preach against it for the unveiling of Jesus Christ (Yeshua HaMashiach) as God’s Light upon the midnight world. Considering these things, and before we move on to the next chapter in Revelation, I think it is important for me, the scribe, to do my part to encourage readers by revealing something important in God’s plan for His elect- for those whom He is calling to His light of understanding and wisdom. Today, we are like worms as our enemies rule over us, but the Bible makes it clear that soon we will fly as eagles, float on the wind like butterflies, and shine as the stars in darkening skies. In all honesty, we have lost the culture war, and the nation (as well as most of the West) is now morally bankrupt and headed for socialist/fascist tyranny; but we can take comfort in the fact that our God is still in control and will use this dark age to separate His faithful people for His coming Kingdom. At home we are maligned by progressive bullies who have subtly worked their way to the highest podiums of legal and political power, like Satan their father, and abroad we see Christian genocide and beheadings by the children of the False Prophet, Mohammad, but in Scripture we see a new day dawning. There is a hidden generation of sons and daughters of God that is called by the name of Christ, Salvation, in which, according to the prophets and apostles, all of creation has been awaiting. They are collectively called the “Son of God,” the “Manchild,” and other such terms that allude to the only begotten Son of God, for they are His “Body” of Believers (wherein there is neither male nor female, Jew nor Greek). Indeed, these are the “generation” of Christ and His spiritual offspring. As Christ is the Head of the Body of Believers, firstborn to the world, the Body comes out behind Him in due time and is, of course (like physical bodies), joined to Him. Often we picture the Jerusalem citizenry that unites to Christ as “the Bride,” for there is a covenant of blood and spiritual intimacy in a personal relationship of prayer, but “Body” is also an appropriate description because we all have appointed places and duties in an assembly of believers under the Head. There are many people who will be saved, and indeed the Gospel will be preached to every soul. Yet not all who say, “Lord, Lord” are the elect coinheritors of the coming Kingdom. Not all of the over two billion confessing Christians in the world today will reign with Him, even as Christ has made abundantly clear. He knows who will pick-up their crosses and endure persecution and trials to follow Him and His Word. In no way will lukewarm liberal Christians be part of the coming glory, but will be vomited out for having forsaken the Lord. Yet those who enter by the narrow gate and obey His call will be chosen and kept if they have put on the garments of righteousness for the coming marriage. They will not fall away during trials, and they are rooted and grounded in the Word. And, even for the martyrs, none of them are lost from His sight. At the doorway of the Great Sabbath this special glorification of the children of God will be manifest. This special entrance was seen in type when Messiah entered the world through the virgin matrix, figuratively as a sealed door because of His unique entrance into the world (see Luke 1:34-35 and Matt. 1:25). And just as Messiah was conceived of the Spirit (Matt. 1:20), the Body of Christ is also formed by the Spirit and brought to a unique, first doorway. Just as the city of Jerusalem awaits a special entrance of Messiah through the sealed Golden Gate of the Temple, there is a precious and refined entrance for the elect, the hidden generation. It is no mistake that the decree is written twice, for the Body of Believers is also considered holy children joined to God’s sacred name, as is the Head we have in Christ. The psalmist is not speaking of all believers, but of a generation that will seek Jacob’s face, the identity of Israel. Whatever glorification awaits, it is clearly something astonishing, and the world will look on in amazement when they are united with Christ after a time of being hidden. As for seeking Jacob’s face, God sought Jacob’s face when he wrestled with him in the wilderness, and Jacob sought the identity of God, which was secret. (We will cover more of this a bit later). In the old Hebrew writing style, as found in the Bible, phrases were often written twice in slightly different ways to add emphasis and clarification. We see this a lot in poetic passages and the book of Psalms. If I was to say, ‘The Lord is my rock of salvation; God is my mountain of deliverance,’ Hebrews of old would automatically known that God and Lord are the same Person in what I exclaim, and rock and mountain are the same, only with growing emphasis. We find that God prepares His elect for what will occur, to strengthen us in a very dark end of the age. He promises inheritance to the faithful and destruction of worldly enemies. As written, “Surely the Elohim YHVH will do nothing unless He reveals His secret to the servants the prophets” (Amos 3:7). Indeed, we do not walk blindly into what is soon to come as those who will be caught unaware as if by a thief in the night, as Paul said, but we have encouragement to face what is to come by knowing(discerning) what is set before us, and in knowing that this, too, will come to pass. 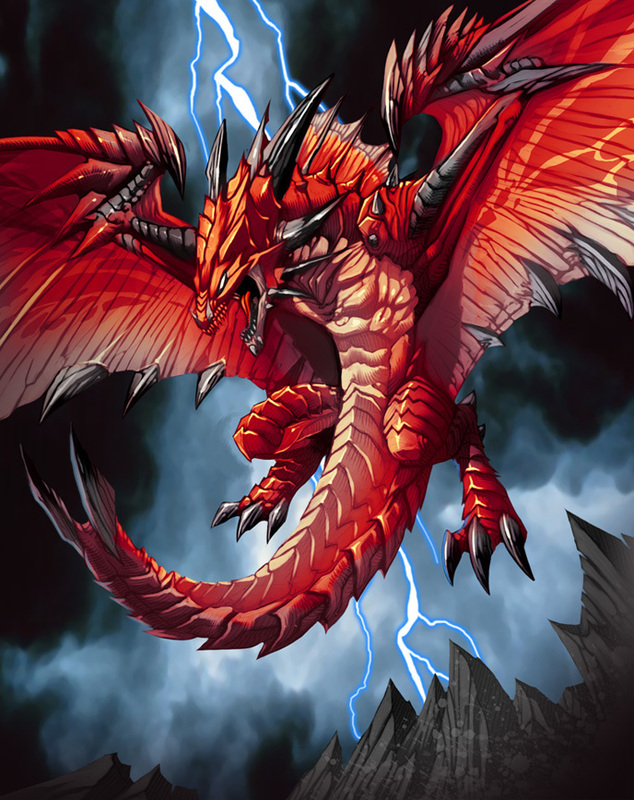 Destruction comes, and the dark world will tremble when God arises to punish the elitists who have conspired against Him, but He will restore His people on the seventh time, granting light. Again, we find that in the seventh year those who die to worldly things, with refinement in trying times, will be redeemed and have a door of escape from wrath, which the prophets and apostles compared to a hiding place. As Paul explained, “For you are dead, and your life is hidden with Christ in God. When Christ, who is our life, shall appear, then you shall also appear with Him in glory.” (See Col. 3:3-4). Then, when the seven years are complete, you will be as a holy bride that is unveiled in glory before the world, like a butterfly, which is exactly what the word Apocalypse means- unveiling. This is the generation that the Lord has chosen and sustains, and this is the holy priesthood- not that which claims (via Peter) something great as their priests forsake the Gospel of Kingdom– those who seek to reign now in their own worldly glory. The question becomes: ‘How does the royal priesthood of the King show forth praises? By singing hymns or wearing priestly garments?’ The clue is that His spiritual offspring are called into the “marvelous light,” which means that they are called to enlightenment and understanding of God’s works. We bring praise to God when we testify to the world of the wonderful things in which He has done. As for the special, hidden generation, it is the 42nd. All the generations from Abraham to Christ are 41, but Levi (called “Matthew” by Christ, meaning God’s gift) the tax collector adds them as if there are 42 (14 + 14 + 14). (See Matt. 1:17.) Thus, if we consider the years of many generations (see Deut. 32:7), we must conclude that either 1) Levi- a trained accountant for the Roman Empire, whose life depended on meticulous counting- made a mistake, or 2) there is a hidden generation somewhere in which he did not list. Of course, we can always take the scholarly approach and assert that the name credited to the Gospel was but a superficial addition to an otherwise unknown author. Yet even then we would be foolish to exclude the fact that God’s Spirit inspired what was written for us to receive and meditate upon. Moreover, we are also called “Christ” by Matthew because we are of Christ, which is what Christian means. We are called to an anointing of the Spirit, to have great enlightenment that brings praise to God as we reveal His works (Word) to the world. The same is true for Messianic believers who hold to the initial Hebrew. The word messiah implies more than merely reading the Word of God, but having an enlightenment to know the depths of what is read. When we truly comprehend the Lord’s work, we can then turn back hearts, and even take back lost souls from the worldly enemies of our God. The above passage takes us back to two opposing worldviews in our time- one of abject materialism (also called neo-Darwinism) and the other of Divine creationism. We declare to the world that the Lord has done the works; and the more that we comprehend from the depths of Scripture, the easier it is to battle those who dwell in spiritual darkness, ignorant of Scriptures. Yet to do this we must learn how the Lord speaks and discloses His mysteries. If we cannot hear from the Holy Spirit to discern simple parables, and cannot bring these heavenly things to earthly comprehension, how can we turn back the hearts of those who also do not perceive and lack spiritual discernment? To follow the Word of Christ, we need not only repeat the mysterious things that He said (see Matt. 13:34-35), but we must have the mind of Christ and know things as He knew them. Today Bible-believers must awaken from slumber and discern things in the Book that have been hidden (see Isa. 29:10-14), for the Age of Gentiles and grace to the nations comes to a close (Rom. 11:7-26). Paul wrote that “We speak the wisdom of God in a mystery- even the hidden wisdom in which God ordained before the world for our glory” (1 Cor. 2:7), but a mystery brings no glory if it is not solved, only intrigue. Yet the elect generation that God is now calling forth will not speak in new parables and mysteries, but expound upon and clarify that which has been written, and already this is taking place with the help of the Spirit. Things sealed until the end of the age (see Dan. 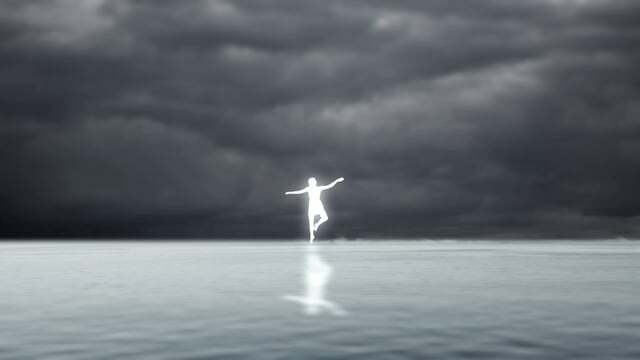 12:9) will be unsealed, and, as the Christ has said, nothing is hidden that will not be revealed. Christ spoke through Isaiah, saying, “I and the children whom YHVH has given Me are for signs and wonders in Israel” (see Isa. 8:16-18), but the signs were not meant to be mysterious bound forever, but to be known in the appointed times to bring glory to God. Isaiah also clarified this: “In that day the deaf shall hear the words of the book, and the eyes of the blind shall see out of obscurity and out of darkness” (Isa. 29:18). Those who will be gathered at the doorway will not have to look to a preacher or priest, denominational doctrine or dead commentary, to have the meaning of a passage told them, but they will each have great understanding as the Spirit reveals through them, for the foundation of the mysteries is being revealed with a restoration of all things. Today, there are too few lions and too many serpents, too few shepherd eagles and butterflies in the air, and innumerable moth worms within the dirt. To have victory, we must collectively have a spiritual metamorphosis with meekness. There are seven appointed years in the build-up of Zion, and today but a rare few Bible-believers have even discerned that there will be an appointed Sukkot. 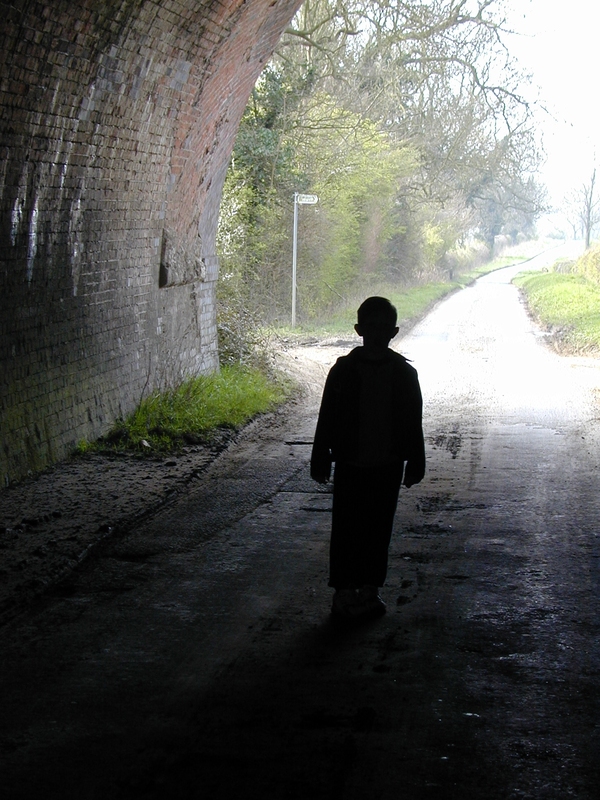 The shadows are being seen, but the Substance that they witness to is not being discerned. Mysteries remain mysteries, yet one would think by all the books and boasts that spiritual giants of great comprehension are all around us. God, however, is not deceived, and God knows how much is lacking because of pride in the Body of Christ. From all these passages, we conclude that there are seven unique years reserved for completing a generation of Christ. The Lord ascended to take His place as the Right Hand of God after 33 years of life and ministry, so 7 years of ministry remain that will complete the 40 years of building-up of spiritual Zion, just as there is a generation of 40 Jubilee years (2,000) that must be complete. As believers, we enter the work of Christ as His “Body.” And just as Joshua led Israel into the Promised land when 40 years were complete, although he made them wait 2,000 cubits behind, Christ leads us by His Word, and He will appear with the Kingdom at the end of His hidden generation. The messianic clock of Daniel that stopped ticking at the sacrifice of Messiah (see Dan. 9:26), resumes with the final seven years (9:27). As Daniel shows, the deceiver, the prince like Titus of Rome, will make a covenant of seven years with Israel and rabbinical leaders, mimicking the covenant that God has given humankind in Christ, which covers people of seven millennial days. Yet the “prince to come” will break that covenant, even as Scripture proclaims, but those who complete the seven years of the Divine covenant in the Word will witness to the promises and inherit the Kingdom. The main point to the above passage is that God will reveal His measurements that confess Yeshua as Messiah, the Cornerstone of His works, and the rabbis and leaders of Jerusalem should heed Him and the Word lest they be cast out during the Apocalypse. They cannot continue to deny Yeshua under false interpretations of Scriptures and traditional lies, if they wish to have part in the coming Kingdom. As written in Proverbs, the righteous may fall seven times but rise again, whereas the wicked who cling to deception fall into mischief (24:16). And without Christ, all our righteousness is as filthy rags- there is no atonement. But as long as there is life, there is hope, and the Lord can enlighten even those who have denied Yeshua, and save their souls from the pit (see Job 33:22-30). Without the Suffering Servant Messiah, there is no Ransom from the shadows to the Substance of true enlightenment. The way of the just is like a shining light that shines brighter and brighter in revealing truth as we approach the perfect day (see Prov. 4:18), but how dark a day it will be (during the regeneration) for those who have blasphemed the Great King and not repented, when He sets-up His judges (Matt. 19:28) over the twelve tribes in the land of Israel? Moreover, there is a time for awakening and accepting truths, for putting away religious lies and any man-made traditions that contradict the Word, and that time is during the Ingathering of the Kingdom. Nature correlates with Scripture to reveal God’s works of redemption through Christ, where spiritual aspects (or metaphysical truths) parallel corporeal cycles and creations. An example of this has been observed in butterflies, which is comparable to the change and glorification that awaits those who are called to the door of the Kingdom. All natural truths of our world witness to the higher objectives of God’s work, to teach humankind spiritual aspects of His redemptive Word; creatures were not created merely for survival and reproduction. The extremely complex metamorphic life of a butterfly discloses natural parallels to the changes that God’s people must undergo. Jacob, father of all Israel, was considered wormy in his ways until the Lord matured his heart, even changing his name to Israel. Israel is called a “worm” by the Lord when corrected by the great Prophet Isaiah (see Isa. 41:14). Righteous Job, however, calls all mankind “worms” (see Job 25:5-6), even his mother and sister (17:14). Moreover, King David, inspired by the Holy Spirit, prophetically compared the Messiah on the cross to a worm or caterpillar in His struggles and suffering (cf. Ps. 22:6). Thus, the whole family of God awaits a glorious transformation in the appointed time, Christ having gone first and then His believing Body. 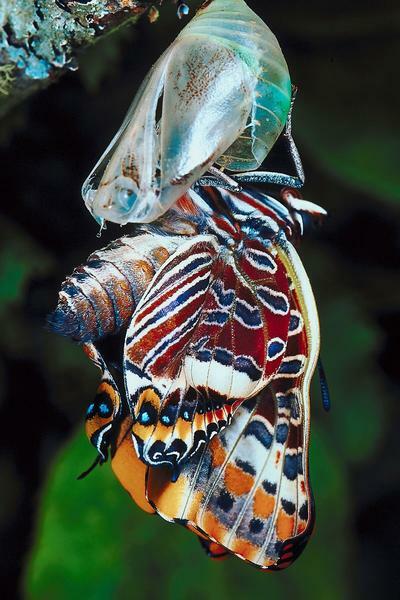 The believer in God is born small and humble, crawling about as he or she feeds upon carnal life, preparing for decomposition in the grave, much like a caterpillar weaving its chrysalis (i.e., preparing for cellular breakdown and reconstruction of new organic patterns during the chrysalis process). 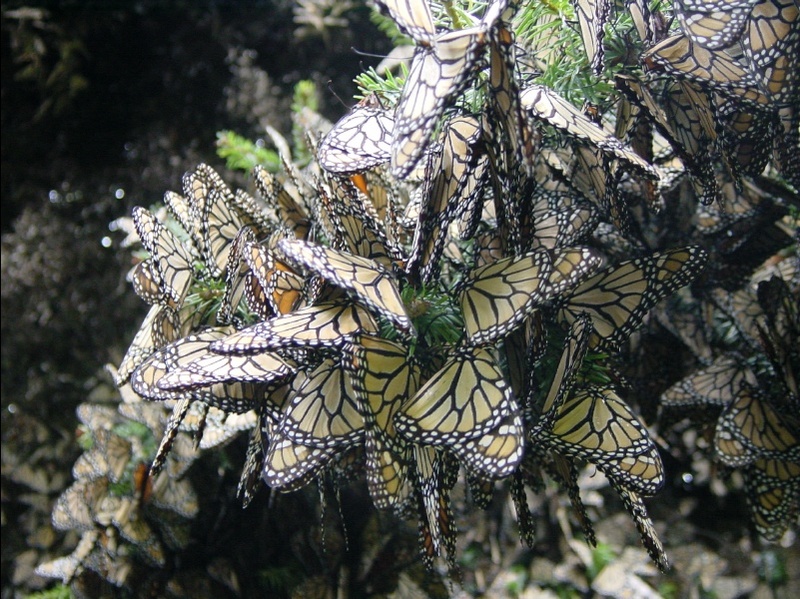 Yet, as written in Scripture, “who has despised the day of small things?” The “butterfly effect” in Chaos Theory mathematics logically hypothesizes that small things can tip delicate scales to provide large scale effects, like a flapping butterfly’s wings contributing to the formation of a whirlwind. 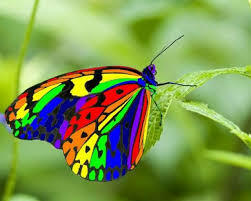 The beautiful and vast arrays of butterflies’ colors correlate with the rainbow as a covenant token of salvation, which was declared to Noah and family after the flood. This salvation is also perceived of Joseph’s multi-colored tunic, which was a sign that he, by his perceived death and resurrection from the waterless pit, would save Israel from a famine, serving as a type of the Messiah ben Yoseph. (See previously posted articles on these.) 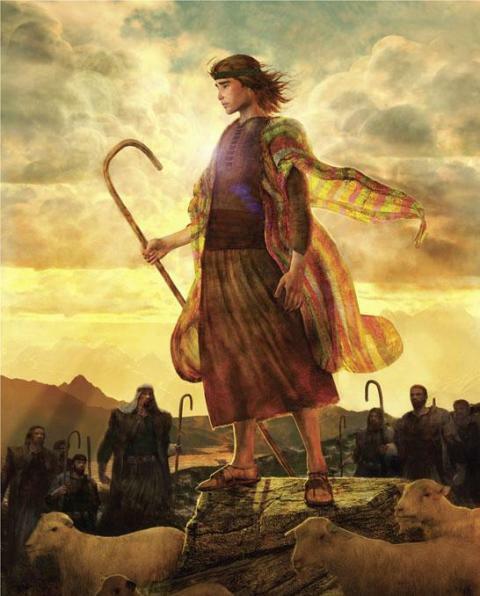 Joseph’s colorful coat was covered in blood, which hid his brothers’ sins in the sight of their father; and all these things are understood by those who perceive the way in which God speaks in similitudes and foreshadowing types. And, of course, the throne of God in Heaven, as perceived and disclosed by the prophets Ezekiel and John, is enveloped by a rainbow’s array of colors, which shows that love and redemption encompass all Divine truths and judgments. With all things considered, it is easy for the mature Christian or Messianic Jew to look upon a butterfly and see the results of the Messiah on a beautifully-arrayed cross, as an example of the imminent salvation and transformation believers will also undergo when awakened to new life (see 1 Thess. 4:14). So, again, the glory of the cross, revealed through butterflies, is a prophetic picture of the transformation believers are promised when we trust in a new life and lay down our old wormy, worldly lives for God’s will. While university scientists are playing God by manipulating DNA, mapping neurons in the brain to control minds, remote controlling rats, tossing around meaningless words like “controlled evolution” for their intelligence-based mad experiments, and foolishly seeking to bring back the dinosaurs through reverse engineering of chickens and other birds (which they mistakenly think evolved from them), the Engineer of the universe is asking, “Who has despised the day of small things?” Insects and even the smallest organisms in the world show forth the glory of God’s work, specifically the redemption we have through His means of direct transformations. Yet, if we despise and do not observe, we miss many clues that God has given us that relate to our own ascension and time of redemption. In the same way, believers can compare moths to those who do not believe God’s Word, but choose their fortunes solely in this world with a metamorphosis into carnal darkness. Moths usually have drab colors, unlike butterflies, and are usually nocturnal by nature (i.e., loving the night), whereas butterflies are diurnal, meaning they naturally dwell in the daylight. 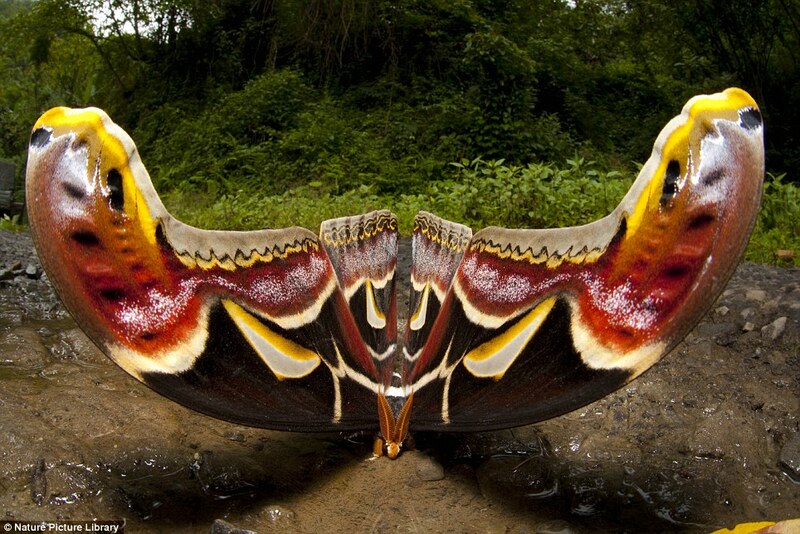 Largest Boasting Moth, Atlas, Serpent Heads on Wing of Abominations, Eagle or Dragon? When the entire chapter of Job is thoroughly read and considered, he describes what happens to people who oppress others to build stored wealth, who in their vanity forsake God during their lives for unmitigated pleasures. All that they thought to build is divided by others at their deaths. Their silk clothes and fine materials are left behind and cannot benefit them. 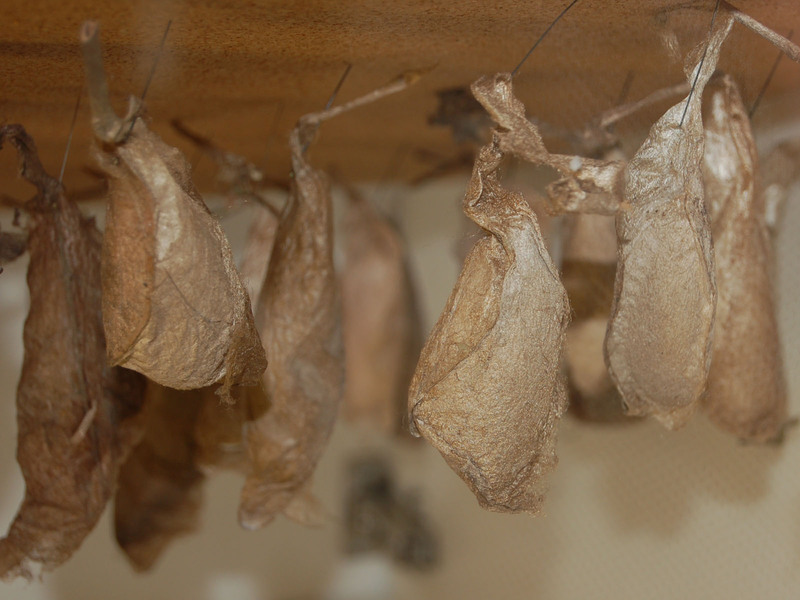 As for weaving their transformations, Job compares their works to a silk cocoon of a moth or a temporary shelter in the wilderness, which cannot stop the inevitable terror of darkness and harsh spiritual winds that will carry them away in the afterlife. But the temporary tabernacles of those who obey God will be glorified at the coming of Messiah. Our metamorphosis is glorious and given to the Light. 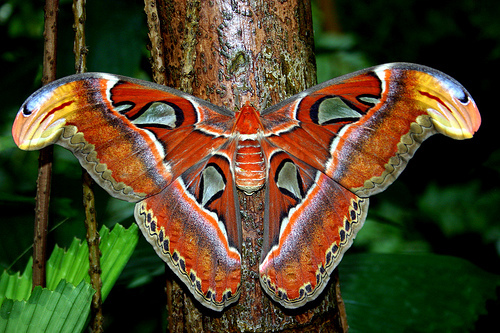 In general comparisons, most moths starkly contrast the colorful and brighter awakening of butterflies. What I have sought to do in the two examples is express how nature confesses spiritual truths, aspects of both good and evil, and even the subtle deceptions in-between. The more one understands spiritual laws and truths, the more he or she understands the organisms that God has designed to express those truths in nature. These things, however, can only sound foreign and mystical to nonbelieving naturalists- no matter how many correlating verses are given to support the “whys” behind their organic designs- as well as by some Bible-believers who do not contemplate things of nature in this way; if all believers did, all of nature would be documented as unique messages from God that teach us the truths of spiritual life and the Designer’s greater objectives through our struggles with good and evil. For some of us, however, this revelation of the butterfly is as factually true as a simple claim that some trees bear fruits while others do not. 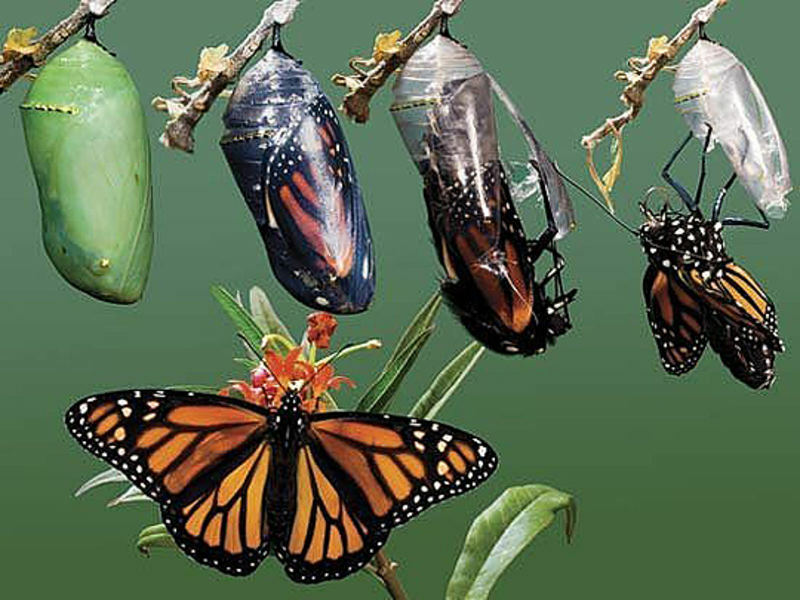 We cannot empirically prove that the Creator designed butterflies for the purpose of showing new, glorified life to come to His elect, or new spiritual life for believers as they are transformed in their lives, but in faith we can find a few related Scriptures and allow the Holy Spirit (A.K.A. Ruach HaKodesh) to help us form biblical conclusions from the most obvious of these kind of mysteries. That being explained, naturalists have their own mystical beliefs in butterflies- one that requires much more faith in the power of blind nature than what is possessed by the scribe of this article. They cannot truly account for the extreme complexities of multiple body plans in these amazing creatures (or their metamorphosis process), not with the clumsy tool of natural selections of random mutations, but they give their just-so stories nonetheless, whereby the naïve believe that they actually provide scientific answers to the creatures’ origins. And, as with the butterfly, ad hoc explanations for the means of organic designs are given by them for all species to support their belief in macroevolution. Evolutionists cloak their materialistic ideology with presuppositional fantasies, good-measure facts, and misleading scientific jargon so as to convince the unsuspecting of their authority in interpreting nature by means of evolution. They may write of phylogenetic similarities in like insects, such as sequences of amino acids in proteins or nucleic acids in genes, but none of these things truly explain the origins of objective-performing, purposeful designs. Their extreme faiths are placed in random build-ups of magnificent features by successions of naturally-selected mutations, which in many cases have been clearly revealed to be impossible (cf. Michael Behe’s Darwin’s Black Box). All their stories are ridiculous without allowing for the interventions of an intelligent Creator. Yet with over 65% of American Jews now admittedly atheists who accept the teaching of blind, unguided evolution, they remain blind to the transformation of the elect to come as well as these witnessing shadows. 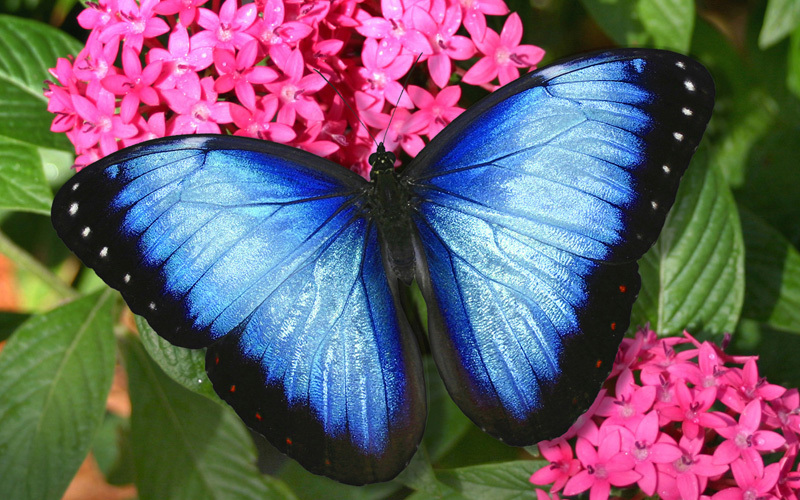 Think of all the ways Darwinian evolution utterly fails to account for the butterfly, especially with its simplistic, grossly inadequate explanation of random mutations “evolving” the magnificent life of the creature. 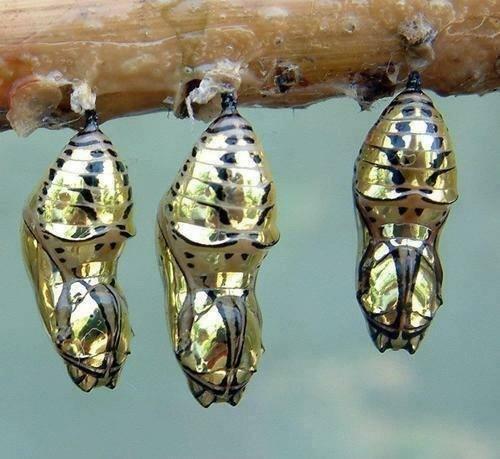 First, an egg filled with its own universe of specific genetic information is required to undergo extremely complex works; then comes the life and times of the larva with its unique features and abilities; followed by this is the pupa stage, where it builds its own decomposition chamber, where it breaks down its cells and forms a completely new organism; finally, it emerges for the fourth stage: the butterfly that takes to flight and possibly to migration. I dare assert that the egg alone would forever be an impossibility of the unipolar, superficial mechanism of the so-called “modern synthesis” (which arose in the 1930s). It is ridiculous that randomness in nature is still the only explanation of our obstinate naturalists, whereby a Creator’s intelligence, far superior to their own, was necessary to coordinate vast amounts of genetic information for features necessary to accomplish such a grand feat of successive designs- multiple body plans in a single creature. For those of us who understand that God created the unique body plans of butterflies, and that the colorful creatures confess the transformation that believers must undergo, as well as our migration home, we will continue to consider this theme- the transfiguration of the Bride of Messiah- in upcoming articles. Of course you’d screen your comments and only allow the ones you already agree with, such is the way with false teachers fearful of God’s Word. You rest in the corrupted comfort of like-minded others who have led you astray while God weeps for His lost sheep and longs for your return. How long before you return to God and revel with Him in the glory of His Love? Like the impatient and selfish son, you lie down with the swine while God has already prepared a place for you. You wrote: “Of course you’d screen your comments and only allow the ones you already agree with, such is the way with false teachers fearful of God’s Word. You rest in the corrupted comfort of like-minded others who have led you astray while God weeps for His lost sheep and longs for your return.” The problem with your assertion is that is completely baseless; it comes from the conjectures of your own mind. I only have two friends, and each of them live in another state. One, I rarely here from, and the other I have never met. I dwell I alone, completely alone. Hence, how can you have a name like “Elijah” or speak for God and be so far off? In your other comment, you mentioned that I need better proof reading, but the reason many of my articles lack a proper editing is because I do all of it alone and have much to teach from Scripture. Hence, I do not “lie down with the swine,” for I always sleep alone, and I don’t date. Moreover, your statement is factually incorrect whether you meant it spiritually or physically. As for screening my comments, again you are incorrect. A wonderful messianic Christian woman, one of my two friends from another state, helped me get started on this, free to me; and although I wanted to let anyone comment, she prefers to read them first because so much profanity is left in comments section; I respect that and her. You call me a false teacher, but nowhere in your personal assessment of me did you provide any details of what you think I am “hateful” about. As for my ideology, it does not perfectly fit Protestantism, Catholicism, Judaism, or even Messianic Christianity; it was developed by me, myself, and I during years alone with God and studying Scriptures. I do not expect you to agree with it, but I am thankful nonetheless for you taking the time to comment. Meh. Such hatred masquerading as faith, you make a mockery of God. What a horrendous work of false teaching and proof-texting. As a brother in Christ, I urge you to repent and confess your blasphemy. I suspect you have surrounded yourself with other like-minded false prophets and would only lean on their own understanding because you are comforted that it matches your own fallen ideology. Of course, God knew you would do this, let you harden your own heart & corrupt your own thinking, and loves you regardless, but how long will you grieve God while leaning on your own understanding? This is truly an age of charlatans run amok, with few others walking in the love of Christ. You are welcome, and I’m glad my humble article provided you confirmation in what you were seeking from your dream/vision. As long as I have but few commenters, which doesn’t appear likely to change soon, I can reply to any questions or thoughts on the subject matter. I think butterflies are one of many natural confessions to our spiritual plight in this battle of good and evil, and I hope more believers begin to make correlations of nature to this current age of mortality and the redemption in which we await. Shalom.